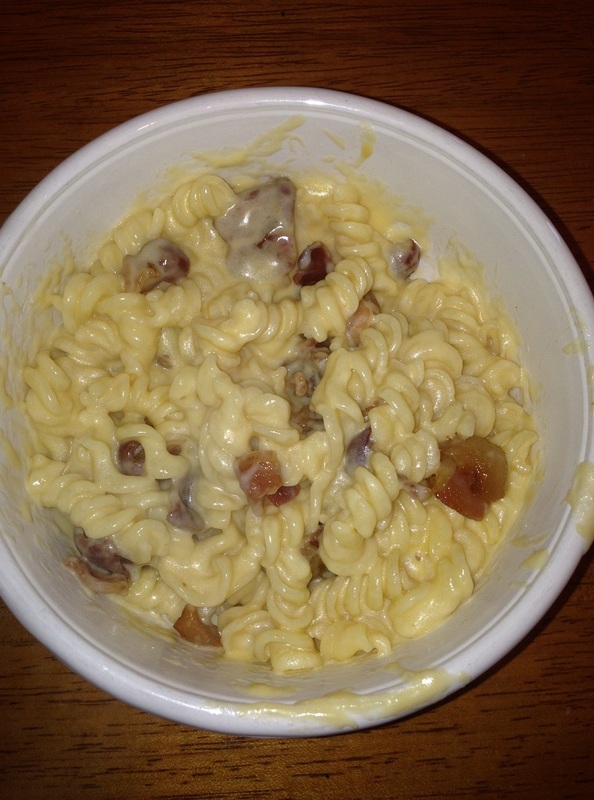 There is no other way for me to say it – I don’t like macaroni and cheese. I don’t eat pasta or cheese, so for me, this meal is almost the worst combination you can come up with (it’s right up there with lasagna and baked ziti for me). I know this may sound like blasphemy, but it is just the way it is for me and my family accepts it. That doesn’t change the fact that Michelle and Sean both love macaroni and cheese and would eat it just about every day if they could. That being said, usually when it comes to making macaroni and cheese in this house, I step away from the kitchen and let Michelle take over. She knows how it should be and should taste so I just let her do it. When she and Sean saw this recipe this morning from Amy Thielen on Food Network, they immediately decided they wanted to try it for lunch today. Heat a small skillet over medium heat; add the bacon and cook, stirring, until the bacon is lightly crisp, about 7 to 8 minutes. Drain and set aside; reserve the bacon fat for another use. Bring a 2-quart pot of water to a boil. Salt the water generously. Add the pasta and cook, stirring occasionally, until it is just tender to the bite, or al dente. Before draining the pasta, use a heavy liquid measuring cup to pull out 3/4 cup of the pasta water; set the water aside. Drain the pasta and return the pot to the heat. Heat the butter in the pasta pot, then add the cooked pasta. Stir in 1/2 cup of the reserved pasta water. Add the shredded American cheese and stir until the mixture is smooth. Add the shredded cheddar cheese, milk, pepper and the cooked bacon and mix well. Dribble in the extra pasta water as needed to make a soft, creamy sauce. Garnish with parsley if using. Serve immediately. It seems to me that this is just as easy as it would be to open one of those boxes of macaroni and cheese that have the cheese “dust” in it and I have to admit this smelled a lot better than the usual mac and cheese to me because of the use of the bacon. Sean absolutely loved it with the bacon in it, since bacon pretty much makes everything better anyway. Michelle really enjoyed it as well, though she thought it could use some more cheese in it and vowed to add more the next time around. Overall it seemed to be a pretty good hit with both of them and showed plans on bringing some to school on Monday for lunch. That’s all I have for today. Check back next time for another recipe. As always, there is still plenty to share as we are always trying something new around here. If you ever have any recipes you would like to share or something you would like to see on the blog, feel free to leave a comment, or catch up with me on Facebook or Twitter or send me an email at IguanaFlats@msn.com. Until next time, enjoy the rest of your day and enjoy your meal!